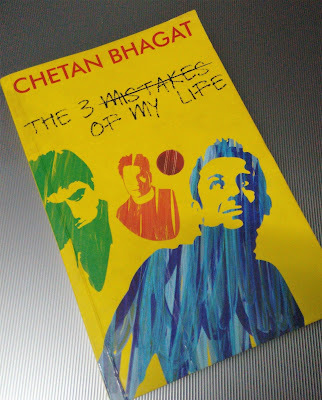 The 3 mistakes of my life - Third book of Chetan Bhagat. What I liked most was the fact that Chetan Bhagat has narrated the story in a way that almost looks like an auto-biography with the author himself getting involved in the story. This style definitely increases the credibility of the story. The story revolves around 3 boys who are good friends and their all-encompassing passion with the national hobby – cricket. They recognize a great talent in a small boy who has the potential to become a national hero. It is now their common desire to help and protect this young kid to help achieve this goal. Based in Ahmedabad and set in the background of Godhra Violence, this story depicts the way emotions and allegiances change in turbulent and violent times. How people go mad with religious sentiments to shed lives that they have never thought of before. It brings the worst out of humanity with people killing their own !! A tale of continuous struggles of these young and budding entrepreneurs and cricketers from a small town and meagre means who have talent to make it big. Mix it with a little emotional tangle and love, caste and religious differences which pop up even amongst close friends who would have otherwise laid down their life for each other. Overall a very easy read, written in simple language so everyone can understand with the usual masala’s to make an Indian reader tick.